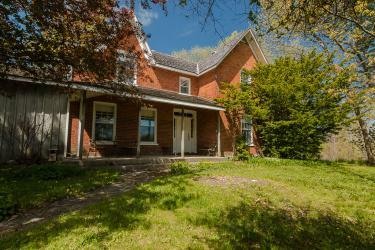 centrally located 2 hours to toronto or ottawa, this exquisite 19th century home exudes character, charm and pride of ownership with thoughtful updates throughout and truly is what dreams are made of. 36 acres rich in serenity and your very own walking trails, waterfront with wood/steel dock, handy mans dream double car garage for all the toys, massive heated workshop with loft and 200 amp service. main level of this stunning century classic, offers ceramic/hardwood flooring throughout, in floor radiant heat in the mud and powder room, family room with soaring vaulted ceilings, flooded with natural light, beautiful post and beam detail, tall standing wood burning fireplace that flows through to the spacious dining area, lovely music room, office, large country custom kitchen with built-in appliances and main floor laundry. upstairs offers hardwood flooring, 3 generous bedrooms, plus den/office, skylights and brand new, bathroom with walk-in shower all awaiting its next proud owner!